Lynch has the A-Team caught, but higher up the chain of command they have other plans. A general, whose nose B.A. broke in Nam, and his daughter are caught by rebels in Borneo. For the A-Team to be free again they have to accept the mission and complete it. The A-Team face a man who having killed a woman's father so she would inherit a fortune, is now putting the pressure on her to marry him. Face and the team have a cunning plan to foil his advances which include Murdock in a wedding dress. The A-Team go to the funeral of an ex-Nam colleague. 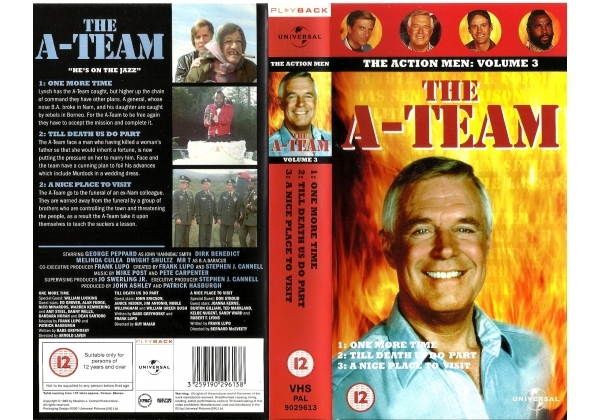 They are warned away from the funeral by a group of brothers who are controlling the town and threatening the people, as a result the A-Team take it upon themselves to teach the suckers a lesson. Run Time Approx: 137 mins. Or find "A - Team: Vol. 3 - One More Time/Till Death us Do Part/A Nice Pla" on VHS and DVD / BluRay at Amazon.